"NSY" redirects here. For other uses, see NSY (disambiguation). The name derives from the location of the original Metropolitan Police headquarters at 4 Whitehall Place, which had a rear entrance on a street called Great Scotland Yard. The Scotland Yard entrance became the public entrance to the police station, and over time the street and the Metropolitan Police became synonymous. The New York Times wrote in 1964 that just as Wall Street gave its name to New York's financial district, Scotland Yard became the name for police activity in London. This building was acquired by hypermarkets operator Lulu Group International in 2015 and redeveloped into a luxury hotel, which is planned to open in summer 2019. 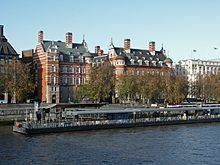 The force moved from Great Scotland Yard in 1890, to a newly completed building on the Victoria Embankment, and the name "New Scotland Yard" was adopted for the new headquarters. An adjacent building was completed in 1906. A third building was added in 1940. In 1967, the MPS moved its headquarters from the three-building complex to a tall, newly constructed building on Broadway in Victoria. In summer 2013, it was announced that the force would move to the Curtis Green Building – which is the third building of New Scotland Yard's previous site (1890–1967) – and that the headquarters would be renamed Scotland Yard. In November 2016, MPS moved to its new headquarters, which continues to bear the name of "New Scotland Yard." The Metropolitan Police Service is responsible for law enforcement within Greater London, excluding the square mile of the City of London, which is covered by the City of London Police. Additionally, the London Underground and National Rail networks are the responsibility of the British Transport Police. The Metropolitan Police was formed by Robert Peel with the implementation of the Metropolitan Police Act, passed by Parliament in 1829. Peel, with the help of Eugène-François Vidocq, selected the original site on Whitehall Place for the new police headquarters. The first two commissioners, Charles Rowan and Richard Mayne, along with various police officers and staff, occupied the building. Previously a private house, 4 Whitehall Place (51°30′22″N 0°07′34″W﻿ / ﻿51.50598°N 0.12609°W﻿ / 51.50598; -0.12609﻿ (Original Scotland Yard - 4 Whitehall Place)) backed onto a street called Great Scotland Yard. By 1887, the Metropolitan Police headquarters had expanded from 4 Whitehall Place into several neighbouring addresses, including 3, 5, 21 and 22 Whitehall Place; 8 and 9 Great Scotland Yard, and several stables. Eventually, the service outgrew its original site, and new headquarters were built (51°30′08″N 0°07′29″W﻿ / ﻿51.50222°N 0.12463°W﻿ / 51.50222; -0.12463﻿ (New Scotland Yard - Norman Shaw North Building (second location))) on the Victoria Embankment, overlooking the River Thames, south of what is now the Ministry of Defence's headquarters. In 1888, during the construction of the new building, workers discovered the dismembered torso of a female; the case, known as the 'Whitehall Mystery', was never solved. In 1890, police headquarters moved to the new location, which was named New Scotland Yard. By this time, the Metropolitan Police had grown from its initial 1,000 officers to about 13,000 and needed more administrative staff and a bigger headquarters. Further increases in the size and responsibilities of the force required even more administrators and space. Therefore, new buildings were constructed and completed in 1906 and 1940, so that New Scotland Yard became a three-building complex. (51°30′07″N 0°07′28″W﻿ / ﻿51.50183°N 0.12446°W﻿ / 51.50183; -0.12446﻿ (Norman Shaw South Building (extension to New Scotland Yard))). The first two buildings are now a Grade I listed structure known as the Norman Shaw Buildings. The original building at 4 Whitehall Place still has a rear entrance on Great Scotland Yard. Stables for some of the mounted branch are still located at 7 Great Scotland Yard, across the street from the first headquarters. By the 1960s the requirements of modern technology and further increases in the size of the force meant that it had outgrown its three-building complex on Victoria Embankment. In 1967 New Scotland Yard moved to a newly constructed building on Broadway, which was an existing office block acquired under a long-term lease. From 1967 to 2016, the third building (then known as the Curtis Green Building) of the first New Scotland Yard was partly used as the base for the Met's Territorial Support Group. The Met's senior management team, who oversee the service, were based at New Scotland Yard at 10 Broadway, close to St. James's Park station, along with the Met's crime database. This uses a national computer system developed for major crime enquiries by all British forces, called Home Office Large Major Enquiry System, more commonly referred to by the backronym HOLMES, which recognises the great fictional detective Sherlock Holmes. The training programme is called 'Elementary', after Holmes's well-known, yet apocryphal, phrase "elementary, my dear Watson". Administrative functions are based at the Empress State Building, and communication handling at the three Metcall complexes, rather than at Scotland Yard. During the 2000s, a number of security measures were added to the exterior of New Scotland Yard, including concrete barriers in front of ground-level windows as a countermeasure against car bombing, a concrete wall around the entrance to the building, and a covered walkway from the street to the entrance into the building. Armed officers from the Diplomatic Protection Group patrolled the exterior of the building along with security staff. In 2008, the Metropolitan Police Authority bought the freehold of the building for around £120 million. In May 2013 the Metropolitan Police confirmed that the New Scotland Yard building on Broadway would be sold and the force's headquarters would be moved back to the Curtis Green Building on the Victoria Embankment, which would be renamed Scotland Yard. A competition was announced for architects to redesign the building prior to the Metropolitan Police moving to it in 2015. This building housed the Territorial Policing headquarters and is adjacent to the original "New Scotland Yard" (Norman Shaw North Building). In December 2015 construction work on the exterior of the Curtis Green building was completed. On 31 October 2016, the Metropolitan Police staff left New Scotland Yard – when ownership of the building was passed to Abu Dhabi Financial Group – and moved to their new headquarters. The new New Scotland Yard building was to have been opened by Queen Elizabeth II on 23 March 2017, but that same day it was announced that the Royal opening would be postponed, due to the preceding day's terrorist attack at Westminster. The Black Museum (also known as The Crime Museum of Scotland Yard), founded in 1874, is a collection of criminal memorabilia kept at New Scotland Yard. ^ a b c "Metropolitan Police Service – History of the Metropolitan Police Service". Met.police.uk. Archived from the original on 3 July 2013. Retrieved 22 March 2017. ^ Farnsworth, Clyde H. (15 May 1964). "Move is planned by Scotland Yard". The New York Times. Retrieved 3 December 2015. ^ "New Metropolitan Police HQ announced as Curtis Green Building". BBC News. 20 May 2013. Retrieved 22 May 2013. ^ a b Bullen, Jamie (1 November 2016). "Metropolitan Police staff move out of New Scotland Yard after 49 years". Evening Standard. Retrieved 12 November 2016. ^ a b The words "New Scotland Yard" (in tall letters) can be seen in a photograph of the front of the building, atop the glass entrance at the base of the facade. Patel, Salina (23 March 2017). "Royal opening of new Met Police HQ postponed following London terrorist attack: The Queen and Duke of Edinburgh were due to visit New Scotland Yard today". getwestlondon.co.uk. Trinity Mirror Southern. Retrieved 23 March 2017. ^ Justin Davenport (30 October 2012). "Metropolitan Police to sell New Scotland Yard". Evening Standard. Retrieved 26 May 2013. ^ "Met confirms Scotland Yard to be sold". The Australian. 20 May 2013. Retrieved 26 May 2013. ^ Spendelow, Nathan (1 December 2016). "New Met HQ officially completed, with police to move in by end of next year". Get West London. Retrieved 12 November 2016. ^ "The Crime Museum". Metropolitan Police. Archived from the original on 24 December 2016. Retrieved 22 March 2017. Wikimedia Commons has media related to Scotland Yard. 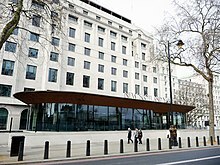 Wikimedia Commons has media related to New Scotland Yard. Blumberg, Jess. "A Brief History of Scotland Yard", Smithsonian.com, 28 September 2007.